A compelling local offer [MA only] hit my inbox today. After watching this space for several years, I've become systematic in how I consider an offer. 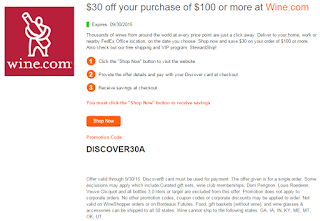 Quite a few retailers subscribe to this site, so I thought it would be interesting to walk through the process both from a consumer's perspective as well as to those who write the offers. This particular offer came from Mike O'Connell from Upper Falls Liquors. Here is a link to the offer. Am I interested in the category? Preposterous Pinot deal. Over 50% off 92pt Gap's Crown Gem. California Pinot Noir continues to be one of my favorite categories so I'd be inclined to look at the offer based on a mention of a "preposterous Pinot deal" alone. But adding the Gap's Crown vineyard really had me intrigued. Some of my favorite producers source fruit for single-vineyard Pinot Noir from Gap's Crown: Kosta Browne, MacPhail, Sojourn, Patz & Hall, plus many more. I've really liked what I've tasted from Gap's Crown so as I clicked through the link I kind of hoped it would be from a producer I was familiar with. At 50% off! But no such luck. 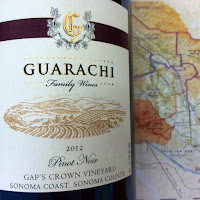 The wine being offered is the 2012 Guarachi Gap's Crown Pinot Noir. I've heard the name Guarachi, but I've never tasted their wines before and I've not heard much buzz about them. I don't know anything about them. The first thing I do in this case is go to CellarTracker to get the community read on the wine. Here's the link for the CellarTracker page for this wine. In this case, there aren't a ton of notes for the wine, which is to be expected given its low production level. I look at the average community rating. In this case, a couple 91s and a 93. If I didn't know the retailer offering the wine, I'd be on the lookout for recent reviews "planted" by someone to bolster the offer. You never know. Then, to get a feel for how each reviewer generally scores wines I might click through to their profile to see how generous they are with big scores. In the case of the reviewer who rated the wine 93 points I see that they also rated the 2010 Saintsbury Brown Ranch Pinot Noir 97 points. So it's clear they're not afraid to toss around big numbers and their 93 might not mean as much as it otherwise would. Overall, it sounds like a solid bottle of Pinot Noir. Not amazing, but certainly very good at least. A 92 point rating by Wine Spectator is compelling. 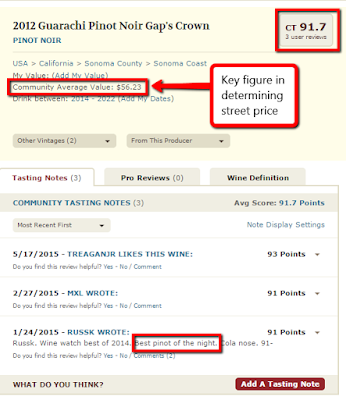 I've been watching Wine Spectator's ratings for years, and I have a good handle on the realtive scarcity of a 92 point California Pinot Noir. Primarily, I'm looking to see that the retailer's facts check out. Sometimes people make mistakes and refer to the wrong rating. In this case, the data checks out. The retailer cited a 92 point rating, and that is indeed the rating. The Release Price cited by Spectator is $75. The retailer cites a Shelf Price of $79.99. Close enough. I also look at the production level, which Spectator cites as 827 to get a feel for whether it is a widely available wine. If it is, I'll expect to see more competition on pricing. For example, take Meiomi Pinot Noir with its 317,000 case production. I'd never go for an online offer that didn't include shipping for Meiomi given its price point and broad distribution. However, with a wine like this Guarachi, I'm not likely to find a lot of global price competition so if I want it, I should go for it through this deal. 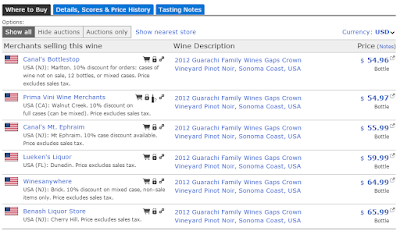 Finally, I check Wine-Searcher to get a feel for what the wine is selling for across the country. Not that I'd actually buy it from an out of state retailer (who likely can't ship here anyway) but I want to get a feel for what this wine is going for. In this case, it supports the numbers in the CellarTracker community average. So everything checks out. This is indeed an opportunity to buy a 92 point Wine Spectator single vineyard California Pinot Noir that normally sells for around $60 for $35 a bottle. The final thing I check, if I'm interested in the wine and perhaps ironically, is the retailers description of the wine. Some people might start there but that's now how I tend to operate. Mike describes it as "Meiomi on steroids". It's as if he's targeting me, knowing I'm a fan of Meiomi. And speaking of Meiomi - that wine can be had for like $14/btl if you're clever and it too was rated 92 points by Wine Spectator. $14 or $35 - which would you choose? I tend to think I would enjoy the Guarachi but having never had it I'm starting to make a different comparision. See, I've been reading this fascinating book called Predictably Irrational. It talks about "anchor pricing" and how we view purchase decisions in relative terms. In this case the anchor price is the $79.99 and we're viewing $35 as a deal relative to the retail price. But at the same time, $35 can be viewed in comparison to the $14 Meiomi since they were both rated 92 points, right? Finally, I start to think abour procurement. Local pick-up. Not super-convenient to me, but not terribly difficult either. This is where things like "free" shipping come into play. Ariely's book also talks about "the power of free". I think free shipping is most powerful in terms of relieving the final objection a customer might have before clicking "buy". It's this final bit of indecision that consumers and retailers will both acknowledge is key. If you don't buy something in the first 10 minutes you're probably never going to buy it. Because there's always a better deal right around the corner and your credit card can live to fight another day. I still haven't decided whether to go for this particular offer, but I thought it would be interesting to pause and write about the thought process I go through when considering an offer. From a consumer's perspective, if you're actively buying and building up your cellar I hope some of the tips are useful. CellarTracker, Wine Spectator, Wine-Searcher. From a retailer's perspective, the fine folks who craft these offers, I hope this is useful as well. I really appreciate what you do. The more you do to make it easy for us to make informed decisions the better. 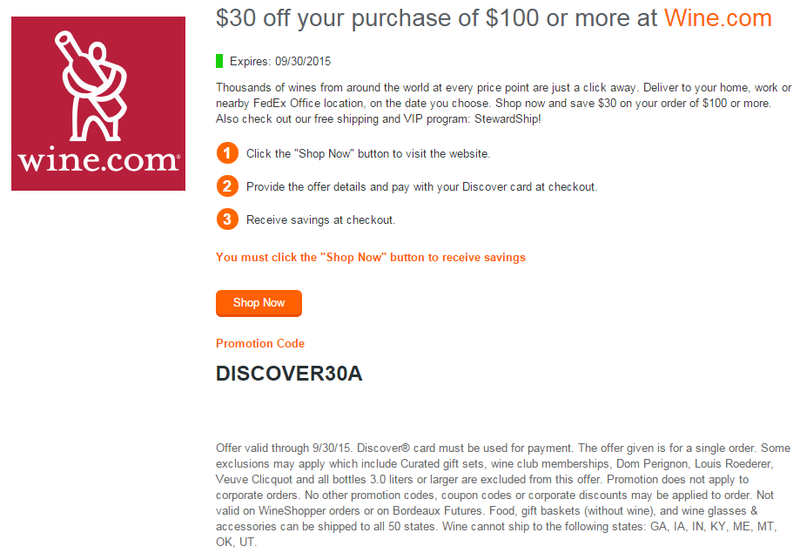 I really like Wine-Searcher and CellarTracker links in offer emails for example. Update: 20% off site-wide at eBay is dead as of 7:30a eastern, but you can still get $50 Darden eGCs for $40. Update 2: The CTWENTY code started working again this afternoon around 4:00p eastern. Update 3: Shortly after 5:00p eastern this was dead again. Never hurts to try! Even 20% off on The Capital Grille is pretty good. Evidently, eBay is offering 20% off everything site wide with code CTWENTY. DoC suggests that although you can use this code multiple times, it may be wise to use it only once to avoid getting banned by eBay. In that case, it may be wise to buy an eBay gift card for around $400 (the offer is capped at $77 off) then use it to buy a discounted gift card or something else in the future. Stack this with the gift cards they're selling at 20% off at retailers like Darden and you can get $50 gift cards valid at The Capital Grille and Seasons 52 for $32 - a savings of 36%. Limit 5 for Darden, other retailers have different limits. Make it even sweeter by starting your shopping through on online portal for an additional 1% off or so (compare rates here). Then, sign up for eBay Bucks to earn a little more off towards a future eBay purchase. Finally, if you have a Chase Ink Business credit card you may be able to get 5X Ultimate Rewards on the purchase if seller is PayPal Digial Gifts and the transactions rings up as "Utilities" and that's somehow considered to be telecom. Crazy, right? 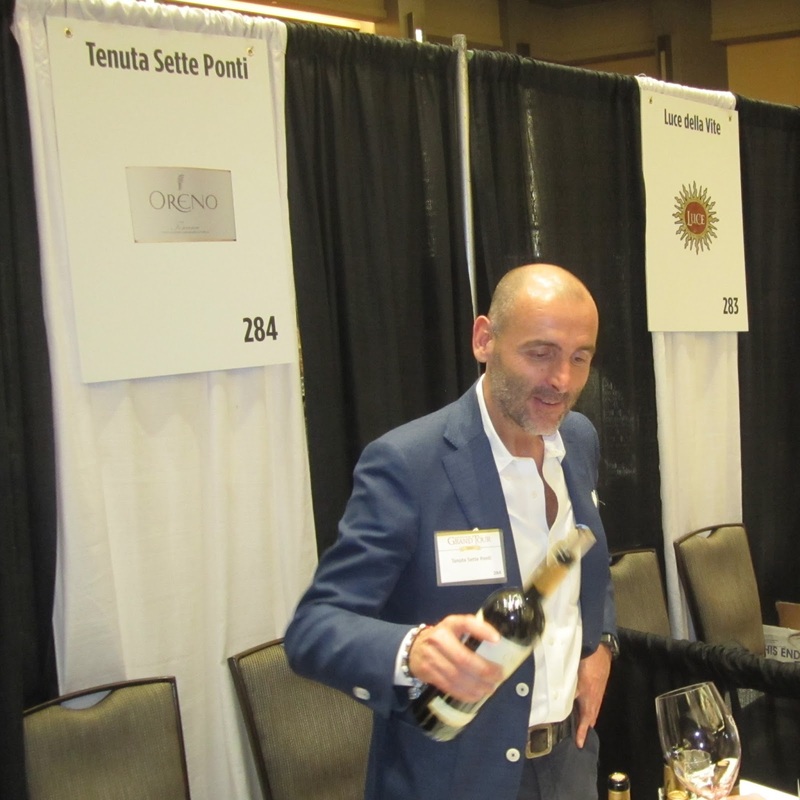 Wine Spectator has wrapped up their Grand Tour events for 2015. This year's stops included Chicago, Las Vegas and Dallas. 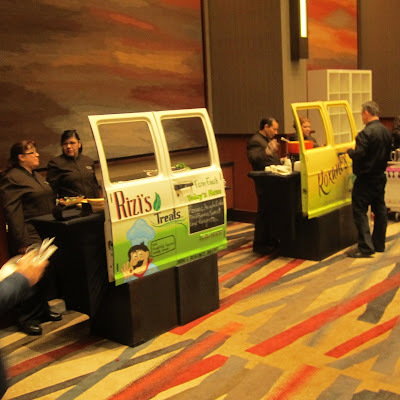 I had the pleasure of attending the event at the Hyatt Regency Dallas. These events are stand-up/walk-around tastings that stop in three cities each year. To me they're noteworthy because the wineries pouring at the event are top-notch, and most are pouring their top wines. Attending one of these events provides an opportunity to taste for yourself the wines you may have mostly just read about in the pages of Wine Specator. 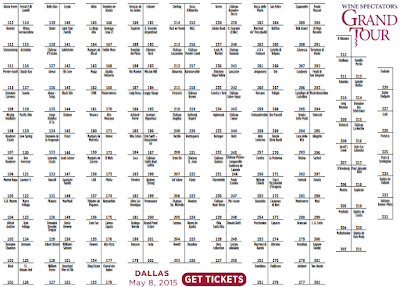 This year's Dallas event was mostly the same as prior Grand Tours. A rather long line forms outside the entrance before it begins, but the admission process runs smoothly and although the event was well attended, lines for tasting were rarely more than one or two parties deep. Rather than conventional banquet fare, light food offerings were served from local "food trucks". I thought this was a very cool change in the line-up and enjoyed snacking on tacos during the event. Additionally, each table seemed to have at least one winery rep as well as one person from the hotel pouring the wines. This kept tasting opportunities moving when the winery rep would get engaged in conversation with an interested party. Very nice. Crowds were managable. I didn't see any long lines in front of any of the winery tables. I didn't see any wineries running out of product early. The venue was well-lit (in contrast with Chicago which was a little dim) and well-run. I attended the event with my wife and met up with a couple friends I've conversed with for years on Twitter. Dallas was a great central location for this kind of meet-up. I hope to pull it off again in the future. My first stop at these events is almost always Kosta Browne. Though I've mercifully attained an appellation-level allocation and have enjoyed visiting them a couple times, it's always a treat to taste their latest delicious offering. They were pouring their 2012 Sonoma Coast Pinot Noir, which was good, but also had what seemed like a secret extra bottle of their Chardonnay behind the table early on. This is unusual because each winery only pours a single wine at the event, and their official wine was the Pinot Noir. If you ever get a chance to taste their Chard I highly recommend it. Absolutely my favorite domestic Chardonnay I've ever tasted. 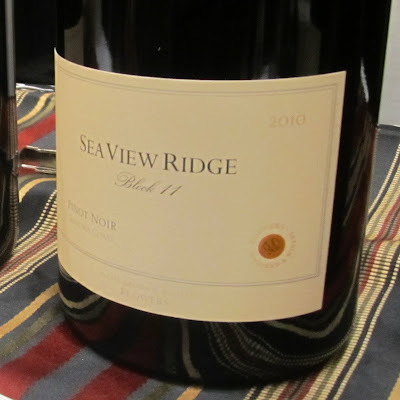 Across from Kosta Browne was Flowers, pouring their 2010 Sea View Ridge Block 11 Pinot Noir. What a contrast in styles between the KB and the Flowers. 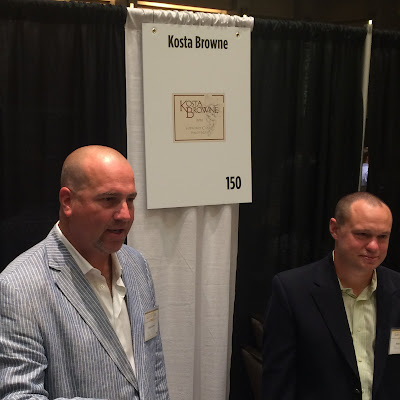 Kosta Browne unabashedly makes "the best damn fruit forward Pinot Noir" they can. And they do it very well. But this Flowers goes in a different yet compelling direction with lithe elegance and gorgeous perfumed aromatics. $75/91 WS. 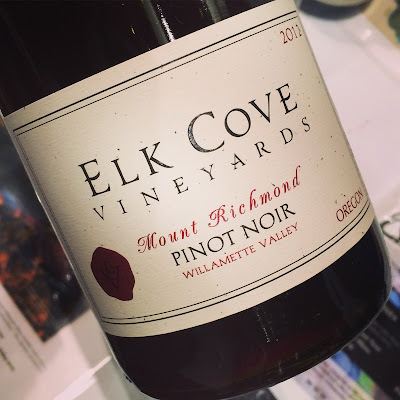 Speaking of elegance, the 2012 Elk Cove Mount Richmond Pinot Noir was spectacular. Drop-dead gorgeous aromatically with floral notes, perfectly-ripened strawberries, and supporting structure that come together magnificently. $60/94 WS. I can't say enough good things about 2012 Oregon Pinot Noir. I'm certain the vintage is going to pass me by without having purchased enough. But then again the 2012 Domaine Serene Evenstad hasn't been released yet so maybe there's still time. The 2010 Caymus Special Selection was probably the most utterly delicous wine I tasted at WS Grand Tour Chicago so I had take the opportunity to try the just-release (and not-yet-rated) 2012. The wine was showing well, and I'm sure it'll garner a high score (the regular bottling was rated 91 points by Spectator) but I wasn't blown away by it at this particular tasting. You know what did blow me away? The 2005 Heitz Martha's Vineyard Cabernet. My goodness, that wine - with 10 years of age - was fully formed and absolutely spot-on just what a Napa Cabernet should be. 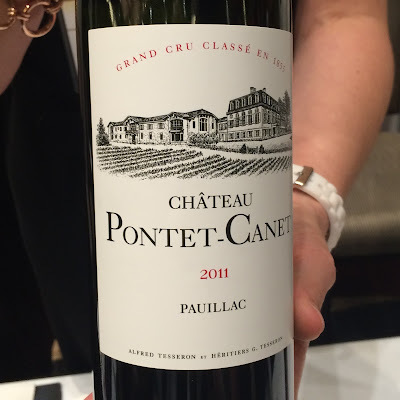 Fruit for days and very generous, but balanced and extremely classy. The complete package. My wine of the night. 98 points for me. But only 93 from Spectator at release. It's no bargain though at $150. 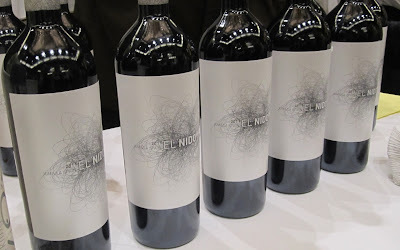 Their regular Napa Cab available for $40 at discounters can be a really good alternative. I loved the 2007 Heitz Napa Cab. But I had the 2010 recently and it didn't satisfy nearly as much. A bit disappointing because otherwise my recent experience with Heitz has been terrific. A few weeks before the event I emailed Loren Gil from Gil Family Estates, the producer behind El Nido. I'd met him in Spain a few years back while tasting at El Nido so I wanted to see if he'd be there and check what they'd be pouring. You see, for as much as I love El Nido Clio (~$40) I really wanted a chance to try El Nido proper ($100+) again. The first time I tried it, it was at the tail end of a long hot day and I really didn't appreciate it fully. So it was great to see El Nido pouring their top cuvee - the 2011 Bodegas El Nido proper. Whereas Clio is 70% Monastrell/30% Cabernet, El Nido flips it. 70% Cabernet/30% Monastrell. The result is spectacular, and I enjoyed "tasting" it tremendously. Several times. And each time it got better. Funny how that works. That said, Clio delivers 90% of the enjoyment of El Nido for me. And I can't justify spending $100+ when Clio is available for less than $40. So what's a guy to do? Drink Clio for $35 and feel like you're getting away with something. I know I do every time I'm enjoying a bottle. Right next to El Nido was Triga (read more...) and Alto Moncayo. Unfortunately, Alto Moncayo wasn't pouring their top wine (Aquilon, 200 cases produced $160/btl) since production levels are so low. But the 2012 Alto Moncayo was showing so well they are to be forgiven. Parker rated the 2009 Alto Moncayo 100 points but I've enjoyed other vintages even more. Like the 2010. And I think this 2012 is shaping up to be every bit as good. So consistently amazing. The whole Bodegas Borsao lineup (the producer behind Alto Moncayo and a number of other great values) is mind-bender. Borsao red, Monte Oton, Tres Picos, and the full Alto Moncayo range. I'd love to get over there for a visit. Clio and Alto Moncayo are big, bold wines you've got to have in your arsenal if you like that style of wine. 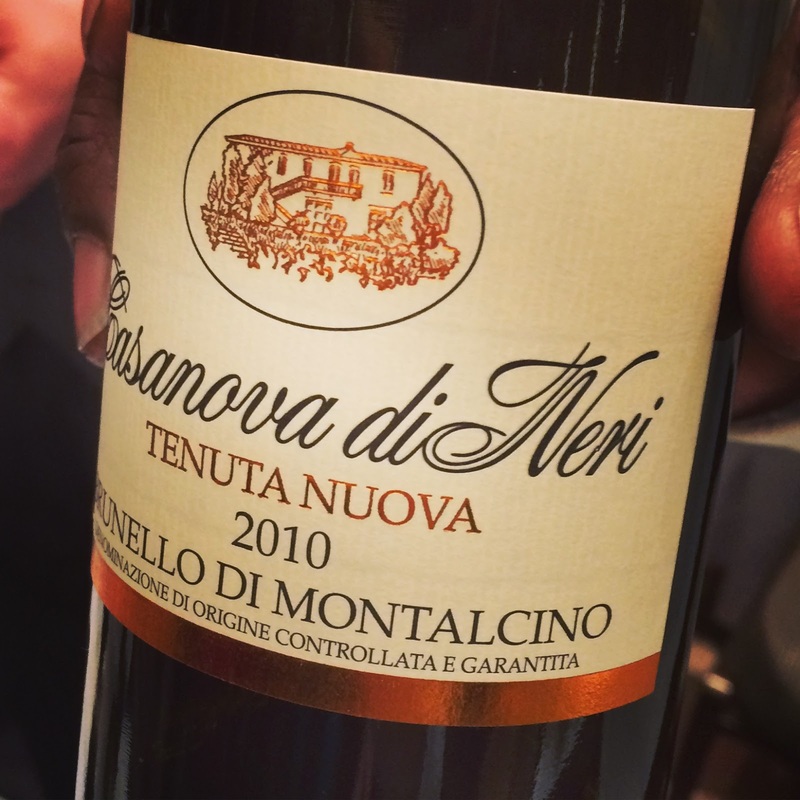 After adoring the high scoring 2006 Casanova di Neri Tenuta Nuova, visting the winery last summer, and seeing scores as high as 100 points roll in for the 2010 Tenuta Nuova I was looking very forward to trying the 2010. It did not disappoint at all but still - even a new-world leaning old world wine like Tenuta Nuova has a hard time competing with bombs like Special Selection, El Nido, and Alto Moncayo. But it satisfied and I can get behind the hype surrounding 2010 Brunello. I'd love to try this again in a few years and with more focus. One of my favorite things about these Grand Tour events is the way you can meet the very same people who you'd meet if visiting the winery. See this guy below? He's Stefano Maggini, export manager for Tenuta Sette Ponti. The very same guy we met while visiting the winery last summer. How cool is that? Not every table is staffed as well, but each of these tastings has the potential to be a mini-visit to the winery. 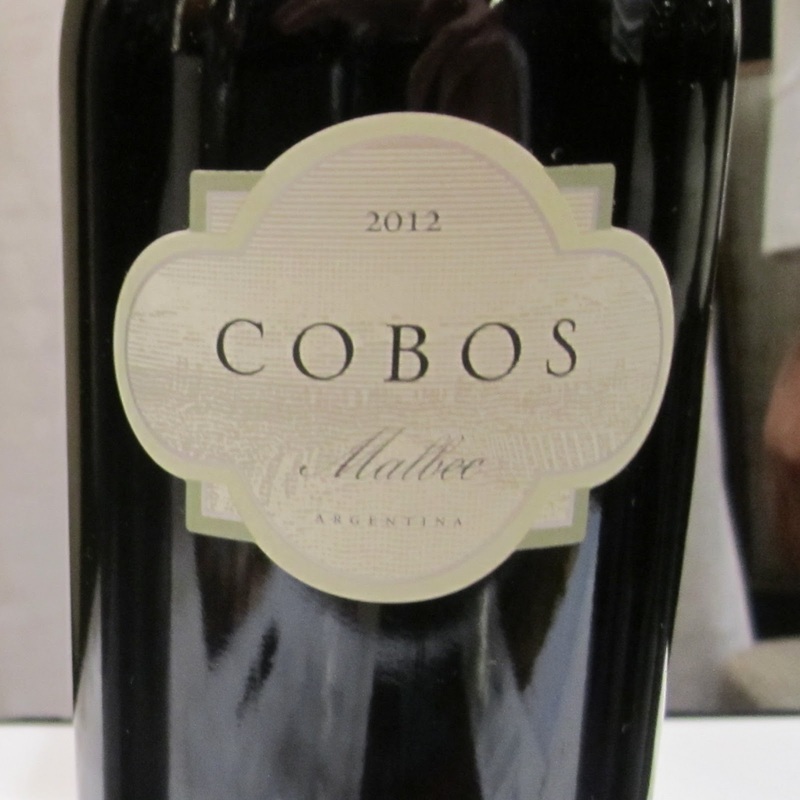 We tasted a few high end Malbecs like the 2012 Vina Cobos Marchiori - the top wine from Paul Hobbs' endeavors in Argentina at over $200/btl. The wine was good, but I've had a tough time finding the enthusiasm for Argentina Malbec that I've developed for new-world leaning Spanish reds. We tasted a few nice Bordeaux like the 2011 Pontet-Canet. I distinctly recall switching gears between new world and old as I tasted this wine, hopping from table to table. The Bordeaux were elegant no doubt, and tasting classy sit-down wines next to bolder "cocktail" wines was interesting. But mixing things up like this was no way to go. It was like having KoRn play your wedding. Two great things that don't go well together. Best kept separate. Wine Spectator Grand Tour Dallas was another wonderful evening of wine tasting. Nobody gets the top producers together (and keeps the riff raff out) like they do. Try as I might, I couldn't resist the temptation to revisit old favorites. Every time I'd try, for example, a sparkling white I'd go scurrying back to the safe familiarity of producers and categories I know I enjoy. Next time I attend I'll try harder to branch out more and try new things. Next time for sure! 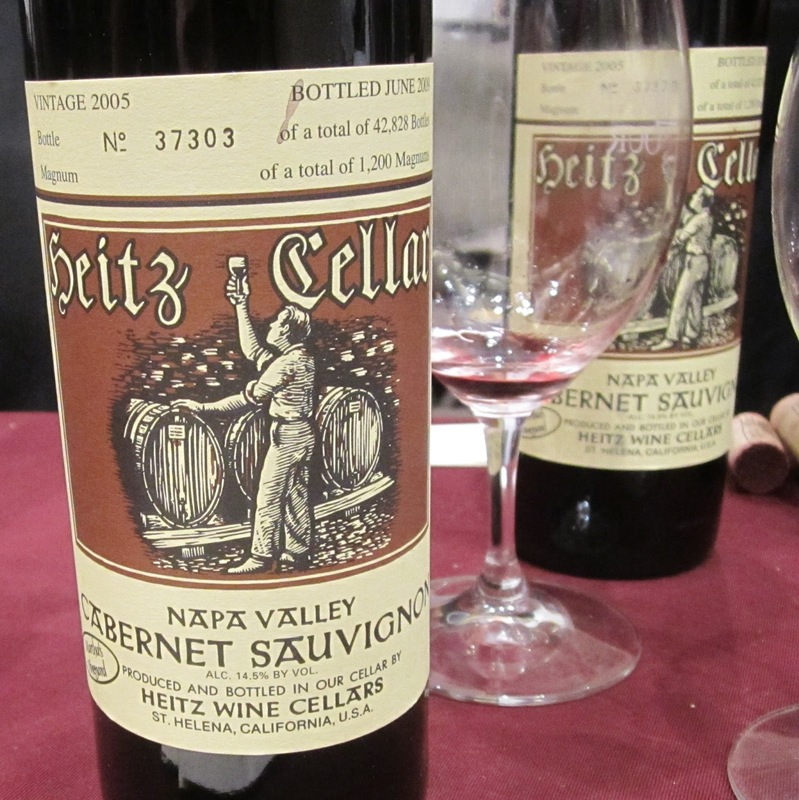 The wine of the night for me was the 2005 Heitz Martha's Vineyard Napa Cabernet. The takeaway on that wine is that 10 years is a really nice amount of bottle age for my taste and reconfirmation that Heitz has made some really nice wines in recent times. The Martha's Vineyard bottling is too expensive for my blood but I'd definitely buy more of Heitz's more affordable bottlings if I can find some. 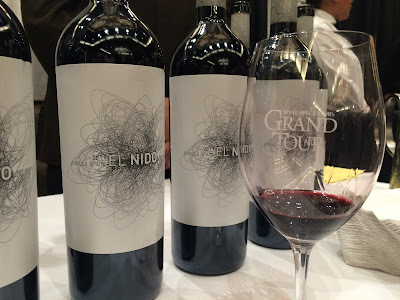 Tasting El Nido proper was a thrill, and was my #2 wine of the night. It's so good, and I'm thankful Clio exists south of $40. It provides such a similarly enjoyable experience without the guilt of a $100+ price tag. The themes of the night for me were contrast (old world/new world), diminishing returns (on very expensive wines vs. their more affordable counterparts), and consumption (I should have taken my own advise of spitting everything you possibly can at a tasting like this to stay sharp). I enjoyed myself very much at the event, but so much for the theory that you can't get a hangover drinking expensive wine. If you'd like to attend a tasting like this, there's one more tasting like this in 2015. It's the Wine Spectator New York Wine Experience in October. Not only is there a Grand Tasting similar to this one, but additionally there are multiple days of moderated sit-down tastings as well. 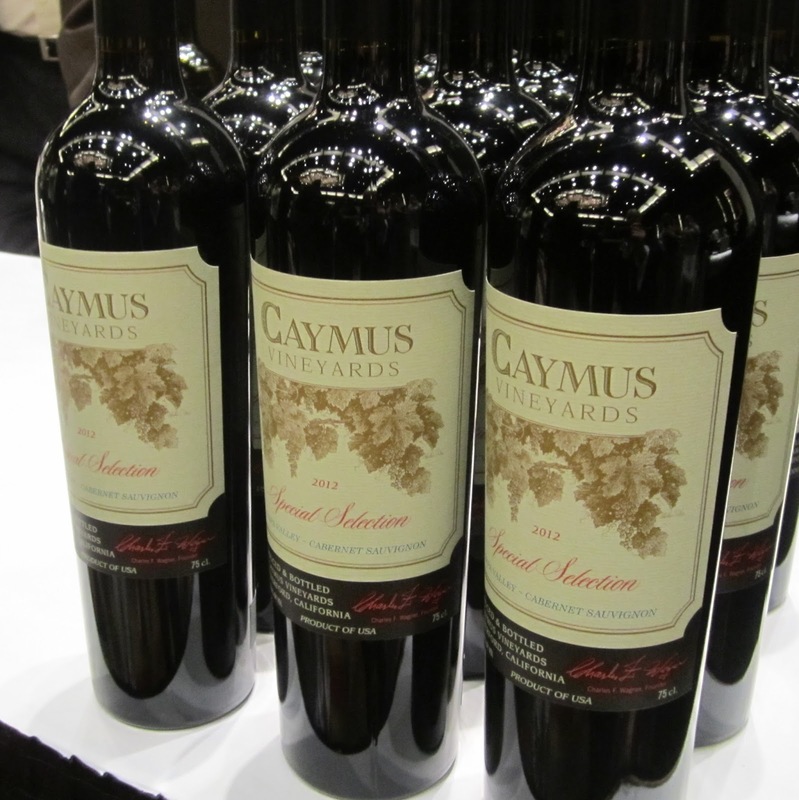 If you're just looking for the Grand Tasting portion use code NYWE by June 30th, 2015 to get $30 off. Question of the Day: Did you attend any of the Wine Spectator Grand Tour events this year? If so, what did you think? If not, have you had any of the wines being poured there? Any favorites?